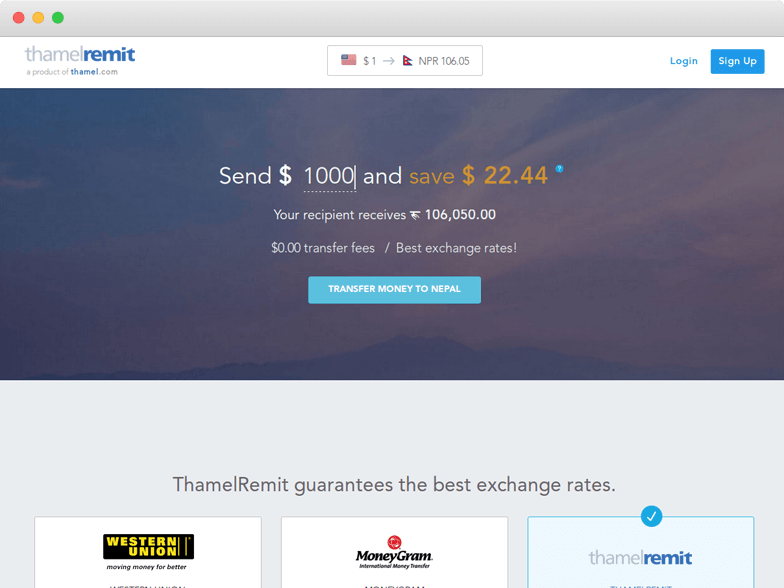 All the useful information that you need to know before sending money with ThamelRemit! ThamelRemit is an online money transferring company which is owned by ThamelRemit Pvt. Ltd in association with Siddhartha Bank Ltd Nepal and is powered by MachNet Inc. It offers online money transfer from the USA to Nepal which is carried by Automated Clearing House or ACH facility, where the money is directly debited in the recipient’s account. The company offers free transfers to its users no matter how small amount you transferred, but it provides a lower exchange rate compared to real-time exchange rates. The company is offering 24*7 customer support so you can contact them on its toll-free number anytime. You can also fill ThamelRemit contact form here to get a callback or write them at their email. The company is highly secure and is verified by GoDaddy, one of the known web hosting company of USA. So for an overall basis, we rate Thamel Remit 7.5 out of 10. Pricing : How much does ThamelRemit cost? The company does not charges fees on the transfers no matters how much amount you are transferring. So, you can save the transfer fee by transferring the funds through ThamelRemit. The company provides a bit lower rates than the live exchange rates, but it is still better than many of the banks. It locked the rates once you start the transaction and the amount you are transferring will be received by the recipient. The company does not charge any other fee from its customers, until if the recipient and transferring bank charge any fee. So, for its pricing policy, we rate it 8 out of 10 because it is not offering real-time exchange rates. Transparency: Does ThamelRemit have any hidden fees? The company does not charge any hidden fees. The amount that you are sending will be received by the recipient after deduction of fees. The company provides Remittance Reference Number (RTRN) at the time of completion of the transaction. You can track the details of transfer on your dashboard through the online tracker by entering the RTRN. Under this head, we rate it 9 out of 10. Transfer Speed: How long does it take to send money through ThamelRemit? The company offers only online transfer through a bank account from many of the banks of the USA. So, it will take at least 3-5 working days until the recipient receives the money. This is a major drawback of the company as those who want to transfer for an emergency could not use its services and it should work on it. Therefore, under this head, we rate it 6 out of 10. Security : Is ThamelRemit Safe? The company is highly secured and offer complete privacy to its users. It is processed by SYNAPSEFI, which is a banking platform and offer best-in-class financial products. It is verified and secured by GoDaddy, which is an American publically traded internet domain and is highly trusted. So, for the security head, experts of Exchange Rate IQ provided ThamelRemit 10 out of 10. The company is providing round-the-clock service to its users, so you can call it anytime. The company is offering its mobile apps for all the users so that they can transfer funds easily from anywhere. The company offers $1 to the users who refer the services of ThamelRemit to their friends when they completed the first transaction using the unique referral link. The company provides promo codes to users through notification, email and SMS which they can use to get cashback on transfers. So, on an overall user basis, we rate it 8 out of 10. If you want to register yourself at ThamelRemit sign up here. Coverage: How many Countries & Currencies does ThamelRemit support? ThamelRemit is only providing its services in the USA, where people from Nepal transfer money to their friends, family or for a business purpose to Nepal. The company has many countries to cover yet if it wants to make it one of the top transfer companies providing its services for Nepal. Therefore, under this head, we rate it 6 out of 10. For using the services of Thamel Remit login here. Go to the Thamel Remit website. Click on “Transfer Money to Nepal” in the mid of home page. Here select the state you are living in and enter email as well as password. It will take approximately 24 hours to get register. Till then, enter all the details required, bank and personal. After the registration completed, enter details of the recipient. Submit amount that you want to transfer. Recheck all the details and submit transfer. After that, you can check your transfer through RTRN on your dashboard.